00:30 – Jason talks about the skyrocketing costs of education and the poor value proposition for some university programs. 02:57 – Jason welcomes Lambda School CEO Austen Allred. Austen concurs with Jason’s introduction and notes the impact of student debt on the economy. The pair discusses current university costs versus justifiable prices. 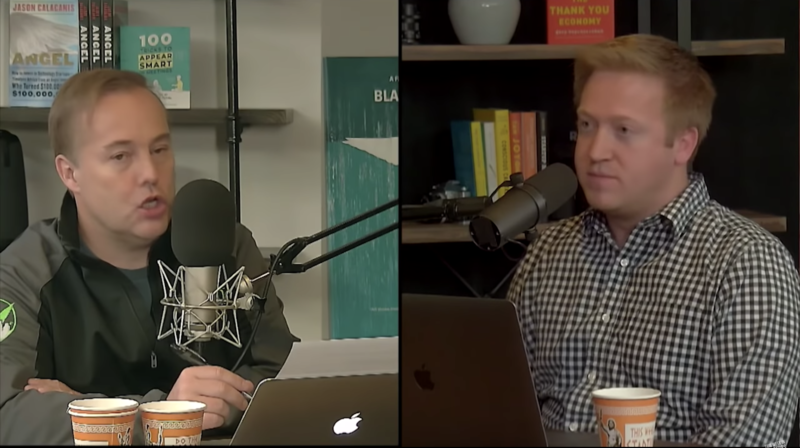 09:38 – Jason and Austen talk about the problem of young people, who might not understand the severity of long-term debt, taking on massive loans that cannot be included in bankruptcy. 11:59 – Jason thanks sponsor Squarespace. Use offer code “twist” to get 10 percent off your first purchase of a website or domain. 14:43 – Austen explains Lambda School’s business model: Students pay nothing up front and Lambda doesn’t make money from a student unless that student graduates and makes more than $50k per year with the skills learned at Lambda. Lambda gets 17 percent of the graduate’s salary for two years (capped at $30k). Subjects are software engineering and data science. 18:58 – Austen talks about Lambda’s focus on teacher/student ratios and how the school attracts top teaching talent from universities and major tech companies. He explains Lambda’s live, interactive classes. He notes that students can’t just move forward regardless of performance: If one can’t complete a challenge at the end of a weekly unit, they must repeat that week’s work. 25:30 – Jason thanks sponsor LinkedIn. Visit linkedin.com/twist to get a $50 credit toward your first job listing. 29:34 – Austen says the average increase in income for Lambda students is $52k per year. Lambda has graduated three classes since launching last year. Austen talks about student acquisition, characteristics of the average student, more. He shares success stories of students who went from manual labor positions to engineering positions at major tech companies. 34:20 – Austen talks about adding new subjects. Lambda’s design program launches in October. Austen says the system could scale to anything that doesn’t require physical touch. He covers the benefits of learning online versus in person. He says self-learners are well suited for programming. 43:55 – Austen covers Lambda’s drop-off rates for the full- and part-time programs. He says that after Lambda’s next fundraising round, the school plans to provide a living stipend in order to alleviate some of the stressors that cause people to drop out. Jason imagines how the world of higher education would change if students only had to repay tuition if they made a certain salary. 49:14 – Austen talks about the gap between the length of most coding bootcamps and the amount of training needed to get a job. He covers internships and apprenticeships. 52:52 – Jason and Austen talk about the University of Phoenix, which Austen says is now a 100-percent scam. That school gets Pell grants, while Lambda is not eligible. Jason notes that the four-year program requirement for academic accreditation forces students to take out loans for something they don’t need. 59:16 – Jason and Austen talk about investing, including investor accreditation and Tesla stock. 01:04:30 – Jason wraps up the conversation and says that while education is a hard business, Lambda has a clever approach and he thinks Austen is going to figure it out.